What Is The Name of Allah's "Religion"? I have been reading these two verses maybe more than a thousand times through my life. Yet, I have past by them heedlessly without paying a real good attention. Why, because Allah reveals "Hikmah" and His teachings to whomever He wills at any time He wills. I only knew that these verses are extremely important verses in the Arabic Quran, then it downed on me the true meanings of them by the will of Allah. Verse (4:125) talks about the "Best Religion" of Allah which was dictated by Allah in His Arabic Quran. "And whose 'Religion' is; better than he who submits his face to Allah and he is Righteous and follows the 'Religion of Ibrahim', the 'Unitarian'. And Allah took Ibrahim as a friend." In this verse Allah is explaining His "Best Religion". As you see Allah is NOT talking about, so called Jews, Christians, Muslims and those other 4200 fake and false religions. Yet, He is talking about His ONLY ONE "Best Religion", which is following from the "The Religion of Ibrahim", or "The Nation of Ibrahim". The Almighty Allah calls those fake religions as "Al Ahzab", "The Parties" sura 33.
Who knows maybe you would be amongst those friends of Allah also. "When his Lord said to him (Ibrahim), "Submit," he said, "I submit to the Lord of the universes." Please Do Not let those illiterate Muslim leaders fool you, who came up with this manmade religion of "Islam", whom they have no idea what is the meaning of their religion, so as the other 4200 fake religions. 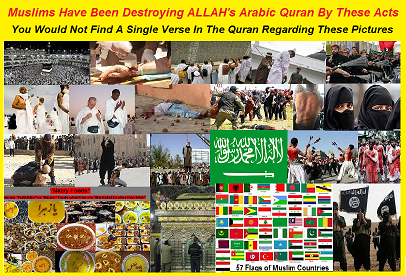 So called "mulims" just took the name "Islam" out of context of the Arabic Quran without reading the whole Quran. "Total surrender to the rules of Allah, which is believing in all of Allah's scriptures, His Angels and messengers, and making no distinction amongst His messengers, and following from "The Nation of Ibrahim". Ibrahim was totally surrounded to the rules of Allah. "Who would Turn away from "The Religion of Abraham", except one who 'FOOLS his own soul'? And We have chosen him in this world, and in the Hereafter he will be with the righteous." "If you are amongst those so called Jews, Christians, Muslims or any of those 4200 fake, false and manmade religions, you are simply FOOLING yourself, simply because you have turned away from 'The Religion of Ibrahim', 'The Best Religion of Allah'"
Thank Allah for His new awesome "Hikmah". "The Religion at Allah is "Islam", "Submission." Ironically, those who have received the scripture are the ones who dispute this , despite the knowledge they have received, due to hostility. And who ever rejects those signs of Allah, then Allah is quick in reckoning." First of all "Islam" is not a name, but a "Description", meaning total submission to the rules of Allah. But, ask those so called "Muslims", what does submission means? Then they stump! "Who would Turn away from the "Religion of Abraham", except one who 'FOOLS his own soul'? If you look up the word "Religion", in the Arabic language "Din" surprisingly you would never ever find this word as 'Plural' in the Arabic Quran! But in 'Singular' form. Sobhan Allah. That means there are no other "ReligionS" but only "One Religion of Allah"
Allah never says in the Arabic Quran that you should be friend of those fake and manmade religions or follow them. "O you, who believe, do not take Jews and Christians as allies; they are allies of one another. And those among you who ally themselves with them, they belong with them. Allah does not guide the transgressors." Allah calls them "Al-Thalimeen", "Wrongdoers", "Transgressors", "Unjust". And in our time we should add so called "Islam" to those fake religions as well now that we know the name of Allah's Only Religion. Only the ones who are "Motahhar", "Pure at heart" can understand it. There are other places in the Arabic Quran that Allah calls these fake religions as "Wrongdoers", "Transgressors", "Unjust". "Had you witnessed "Yaghoub" on his death bed; he said to his children, "What will you worship after I die?" They said, "We will worship your "Ellah"; the "Ellah" of your fathers "Ibrahim", Esmaeil", and "Es hagh"; the One "Ellah". To Him we are submitters." "We worship "Ellah" of "Nation of Ibrahim" and we submit to that fact. "They said, 'You have to be Jewish or Christian, to be guided.' 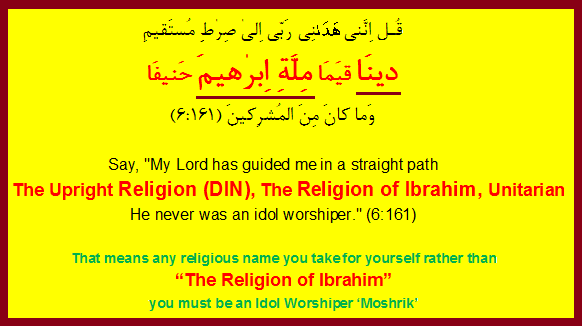 Say, 'We follow The Religion of Ibrahim' - 'The Unitarian' - he never was an idol worshiper." "Say, "We believe in Allah, and in what was sent down to us, and in what was sent down to Ibrahim , Esmaeil, Es-Hagh, Yaghoub, and their descendants; and in what was given to Moosaw and E-Saw, and all the prophets from their Lord. We make no distinction among any of them. To Him alone we are submitters." "We Do Not make any distinction amongst any of those prophets of the Nation of Ibrahim". Therefore, again Allah is saying that "so called Jews, Christians, Muslims" are NOT Guided. 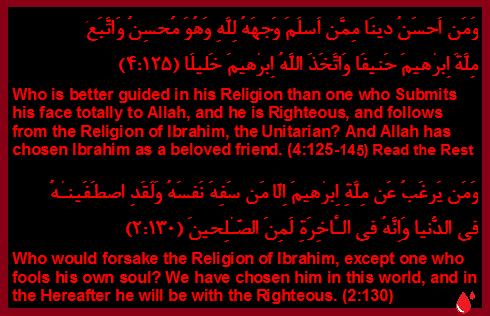 Yet one MUST follow from "The Nation of Ibrahim" in order to be a submitter to Allah. "Or do you say that "Ibrahim", Esmaeil", and "Es-hagh"; and "Yaghoub" and their descendants were 'Jews or Christians?' Say, 'Do you know better than Allah?' Who is more unjust than he who hides the testimony that he has from Allah? And Allah is not unaware of what you do." As you see again Allah is saying that so called "Jews, Christians, Muslims" are NOT Religion's name, yet they made them up. Here is another proof in (5:14) about these fake and manmade Religions. "Also from those who said, 'We are Christian' we took their covenant. But they disregarded some of the commandments given to them. Consequently, we condemned them to animosity and hatred among themselves, until the Day of Resurrection. Allah will then inform them of everything they had done." As you see it says, "They are the ones who call themselves as a Christian" and Allah DID NOT call them Christian. That means they made it up and so called Christian is a fake Religion'. Also in (5:82) we read about the same thing. Thank the Almighty Allah for His "Ultimate Hikmah". I used to be someone quite unaware of our existence yet, I was always looking for the truth behind the creation of our universe. Then, After 30 years studying the Quran, days and nights, hours on end, Allah inspired me about His system, and creation of His seven universes. The Arabic Quran is the Best history. "Submission To The Religion Of Bani Esra Eel"
"Submission To The Religion Of Children Who Would Be Transported By Allah"
This was The Religion of Awedam, Nooh, Ebrahim, Esmaeil, Yaghoub, Es-hagh, Yousuf, Dawwood, Soleymon, E-Saw son of Maryam, Mohammad. And this is the only Religion of Allah from the time of Awedam to the end of this world. That was when Allah inspired us with the story of Awedam's two sons. One of them was righteous and the other one was not righteous. That is why, the righteous one told his brother that, Allah only accept offerings and charities from the righteous people. That is why 10% Zacut charity will not be accepted from the ones, who are disbelievers to Allah. And we are witnessing those disbelievers donating so much money, that never goes to those categories which Allah has commanding us to pay. So, finally one of the brothers killed the other one. Now, here is the awesome part. What an awesome place Allah placed this verse. We have been reading this verse all along, but the "Hikmah" of this verse never revealed to us until few days ago. Allah be Glorified. "And who is better in religion than one who submits himself to Allah while being a doer of good and follows the religion of Ebrahim, inclining toward truth? And Allah took Ebrahim as an intimate friend." (4:125). Let us review it again. Right after that first murder, Allah used the word "Bani Esra Eel". That means the descendents of Awedam are called, "Bani Esra Eel". Then, Allah made the Covenant with "Bani Esra Eel" through the history. That is why, Allah repeated this word "Bani Esra Eel" in the Arabic Quran (43) times. Then through so many verses, Allah wrote for us the Covenants with "Bani Esra Eel". Here you may check them yourself. Here are some of those Covenants: Worship Allah Alone, believe in His messengers, and do not make any distinction amongst them, believe in His Books, and Holy Spirit, Angels, and praying 5 times a day, pay 10% for obligatory charity. Fasting during the month of Ramadan, not going after provisions on Saturdays and so on. Now Allah assured us that this so called fake 'Islam' is a manmade and false religion and their scriptures are those 'hadith, sunna, and sharia law' written by human devil. And they are idolizing Prophet Mohammad against his will. And so called the religion of 'Christianity' is a manmade and fake religion, and their scriptures called "what so called 'Jesus' did, and what 'Jesus' said". They are idolizing a fake and made up name 'Jesus' which is not even in the original Bible in Aramaic language. Their so called Bible is the most distorted of all. And so called fake religion of 'Judaism' have their own scripturse called, "Mishnah and Gemara", Which means, 'What Moosaw said and what Moosaw did'. And on top of that they took out the word "ALLAH" from Torut. And they are only following traditions. So as other 4200 fake, false and manmade religions. Thank Allah for guiding us to His Right Path and showing us His only one True Religion. Here is when we Fall Prostrate to Allah for His Ultimate "Hikmah"
That means forget about Judaism, Christianity, Buddhism, Islam, Hinduism, and other 4200 fake, false, and manmade religions. They are all made up religions.